All Nippon Airways has maintained a Skytrax 5 Star rating since 2013. 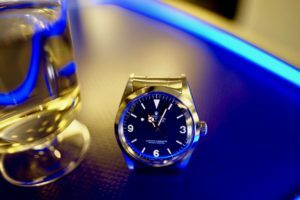 This has made ANA one of the premier airlines for any traveler to fly. In the last couple of years, ANA has expanded their routes significantly outbound to the US. San Jose, Houston, Chicago, and New York are all direct routes available to Tokyo. 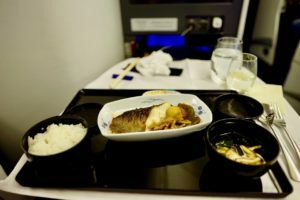 ANA flies modern wide body 777-300 planes, offers four classes of services (First Class, Business Class, Premium Economy, and Economy). 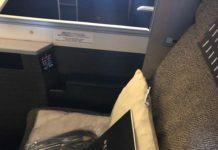 In this review, Team GTE will be reviewing the SFO<->NRT ANA Business Class product. 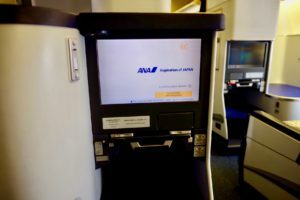 ANA offers dedicated check-in for business class passengers with greeters(speaking both English and Japanese) to help you quickly get to the right counter. 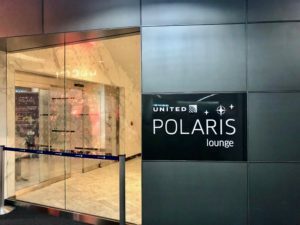 Check in in SFO is always very swift and passengers get access to the new United Polaris Lounge, which is only allows business class passengers. From San Francisco, it is definitely worth going a bit early and enjoying the lounge. 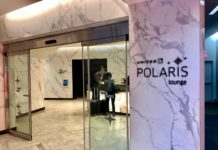 In Japan, one should definitely take advantage of the premium check in where you can have your own private security line when leads you directly into the ANA Lounge. 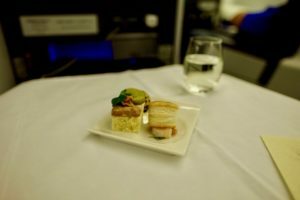 ANA offers four classes of services on their Boeing 777-300 international flights, which includes 8 First Class seats. There are two sections for business class, the first section having 8 seats and second section having 44 separated by a galley. With having a first cabin, even the Business Class cabin feels exclusive as there are less seats. Also, the seats are not in a herringbone configuration so visually, it looks very clean and every aspect of the seat is forward facing. 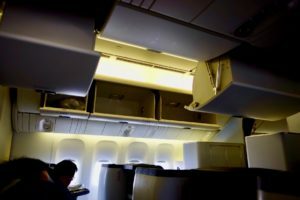 There is also ample overhead storage for each passenger and enough lavatories to go around. 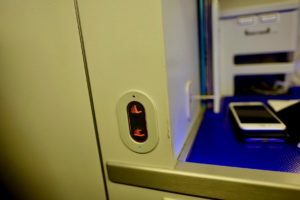 Pro Tip #1 – Team GTE recommends avoiding the middle seats (6 G/E) as the light from the lavatory can shine into your eyes as the doors open and close. The effect is a lot worse when the cabin light is dimmed. Pro Tip #2 – The front seats (5 A and H) have an additional storage section near the window where the bulkhead would be. ANA lighting is always very well lit thought out. 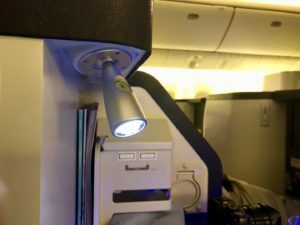 While the cabin didn’t have any fancy mood lighting like light up stars on the roof, the rest of the lighting was extremely functional. 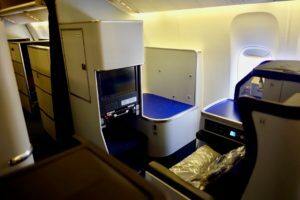 The overhead lighting was placed in a good position, there was a functional 2 setting LED headrest lamp, and the cubby storage area is backlit in cool ANA blue which you can actually turn on and off. There was a light in the footrest, but it was quite dim and did not help much. 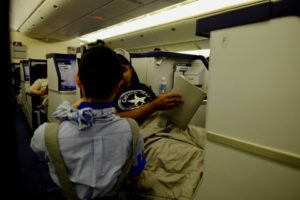 The ANA seats were extremely spacious, comfortable, and extremely clean. You never feel cramped in the seat, both in the actual seat itself and also in the footrest area. 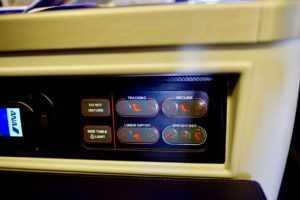 We also liked how the seats had one simple seat adjusting panel with clear instructions as to what each button does. One would be surprised as to how complicated some of the seat adjusting panels can be. Our favorite feature is the “tracking button” which literally just moves the seat forward and backward. 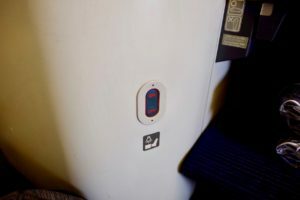 Not ever airline offers that function, as some only track forward if you start reclining the seat. This especially useful for shorter folks so they can get their feet comfortably on the footrest. 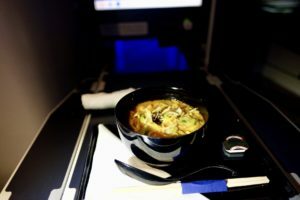 The tray table is one of the largest tray tables we have seen in in business class (The other being Singapore Airlines). Overall, it is hands down the best tray table because of its size, sturdiness, position, and functionality. 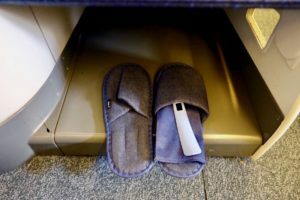 The tray table can extend a whopping 2 feet to sit comfortably however you are sitting in the chair. One can also easily move the table and exit the seat without risking spilling your drinks. All the amenities are already on your seat when you arrive. 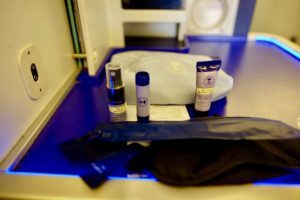 For how great ANA is as an airline, their amenity kits are getting worse and worse. You get your basic toothbrush, lotion, ear plug, and sleeping mask in a basic cloth bag. To emphasize it being “basic” kit is actually part of a sealed plastic bag that includes your headphones and slippers. At this point, we think they should just stop giving the kits and have it all in the lavatories like Singapore Airlines does. 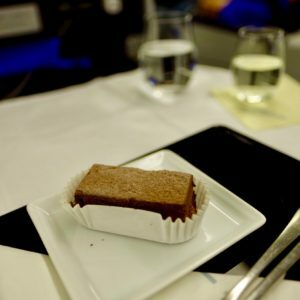 Again, this is why there is a First Class on the plane also. Another pain point is the charging plugs is all the way in the front of the cubby near they TV screen. One better makes sure that they have a long enough power cord or else it will be difficult to access. On top of that, the socket it in such a tight location that you aren’t able to to plug your laptop charger (like for a Mac). The full lay flat bed was very comfortable and sleeping mat was included with your blanket upon arrival on the seat. The mat is definitely worth using as it is very supportive. Not as good as Singapore’s integrated bed, but definitely functional and high quality. 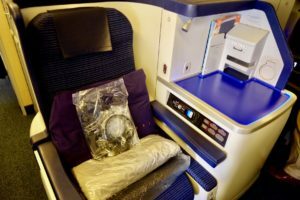 The cabin temperature also seems to be controlled very well on ANA flights, and we noticed they are not as cold as some of the other flights can be so even the thing quilted blanket provided was enough was barely used on the flight. 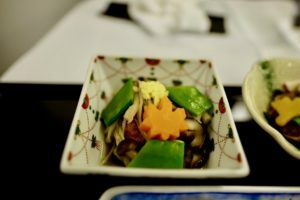 Though the the authentic Japanese food on ANA may not be to everyone’s palette, we recommend that one go outside their comfort zone and experience the Japanese menu and fine Sake that ANA Business Class dining service has to offer. In 2017, ANA was awarded best presented wine list by Cellars in the Sky. 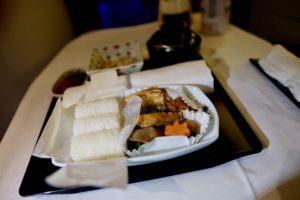 There’s no california rolls or teriyaki chicken, just lots of pickled vegetable, simmered fish and tasty rice. 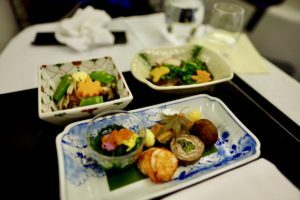 It’s like a mini Kaiseki experience in the sky. If you don’t like it, fortunately they have your standard western options like steak, fish, and chicken for next time. See below for your viewing pleasure. Sesame and cheese ball. Boiled shrimp canapé with honey mustard mayo. Pate de campagne. Grilled channel rockfish with Soy-based Miso sauce. Simmered lobster in soy-based sauce. Grilled leek rolled with beef. Marinate garland chrysanthemum in soy-based sauce. Deep fried tofu fishcake with mushroom sauce. 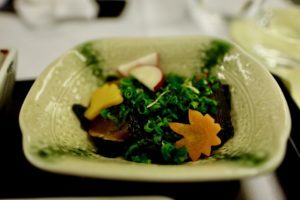 Saikyo miso-grille sablefish served with steamed rice served with Yamahai Ginjo Sake brewed by the “God of Sake” Naohiko Noguchi. Here is a quick guide to what each one of those dining options mean. remember to use that butter! Pro Tip: Try smelling the paper napkin that is they provide. It is made of recycle green tea leaves and actually smells like matcha! ANA Flight attendants are well trained and very friendly. While some of them may not speak the best of English, they are very attentive. It is very impressive that they try to to always speak to you at eye level. Meal service is efficient and they check and restock the lavatory upon every use. 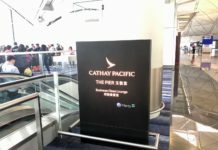 That seems to be a tablestakes for 5 star airlines. 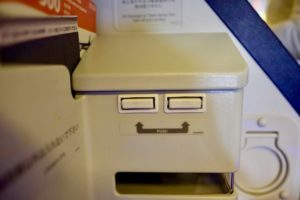 They also do little things like help you put your luggage in the overhead storage when you board. Most importantly, the attendants are always smiling and at least makes it seem like they are enjoying what they are doing! 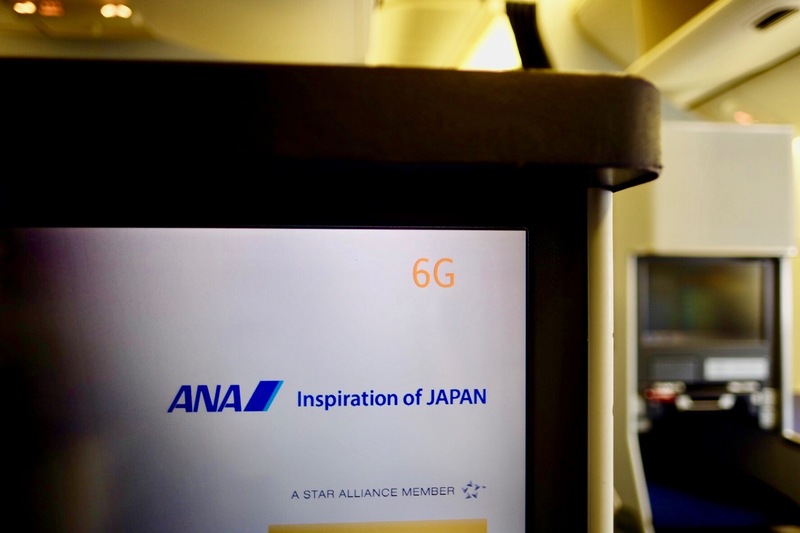 ANA is a solid 5 star airline and a good representation of Japan as a country. 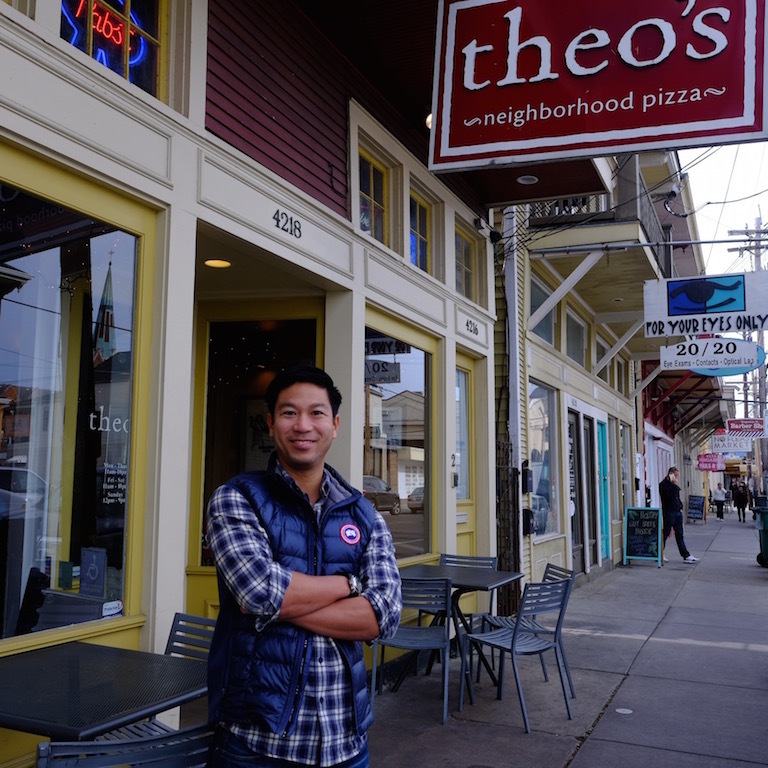 Efficient, simple, friendly, and amazing food. It seems as if it is an honorable job to be an employee of one of Japan’s national airline. 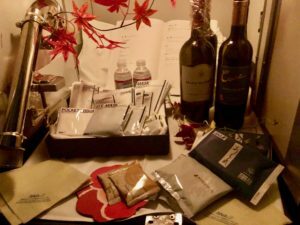 Besides the extremely sad amenity kit everything else about the flight experience is very good. ANA’s not that cheapest airline flying out of the US, but sometimes the prices converge on United’s prices and sometimes you can get a United code share flight with UA as the marketing name at the same price as a United ticket. Give it a try. We know you won’t be disappointed.